There is significant potential to expand the Resources at the Woodlark Island Gold Project by developing advanced exploration targets. These targets are based on geophysical surveys and limited resource definition drilling and are often adjacent to the known Resources. Identified opportunities exist at Kulumadau North, two kilometres to the north east of Kulumadau, Munasi which lies to the south east of Busai and within the Kulumadau deposit due to drill access constraints with the existing Kulumadau Village. The Company has developed a strong geological model surrounding the mineralisation in the Kulumadau area. 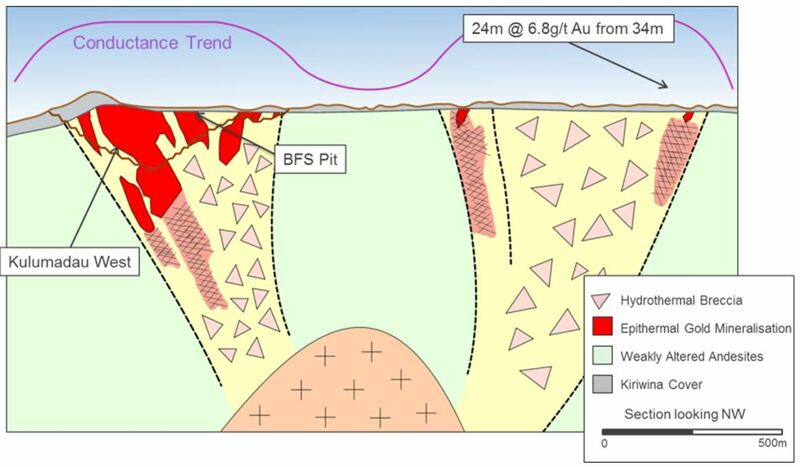 IP Resistivity work and aeromagnetic surveys have reviled a pair of anomalies in the area, with the high grade mineralisation and Ore Reserves contained within the brecciated zones at the edges of the southernmost anomaly. 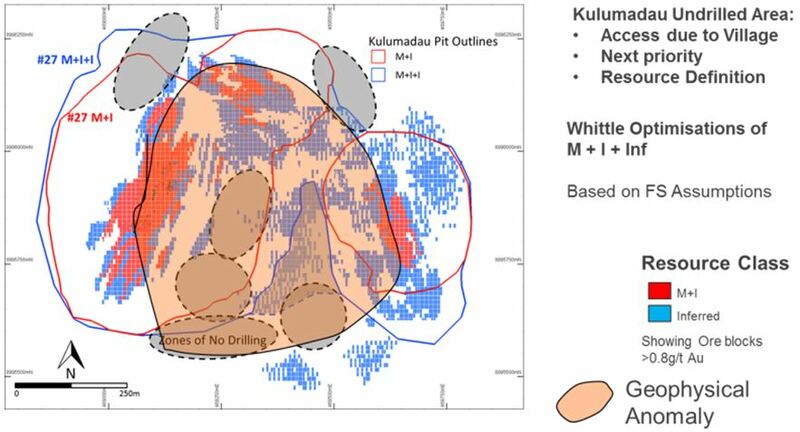 The figure above shows the current open pit outlines which contain the Ore Reserves at Kulumadau (red lines), and the Kulumadau North anomaly interpreted as a second hydrothermal breccia. 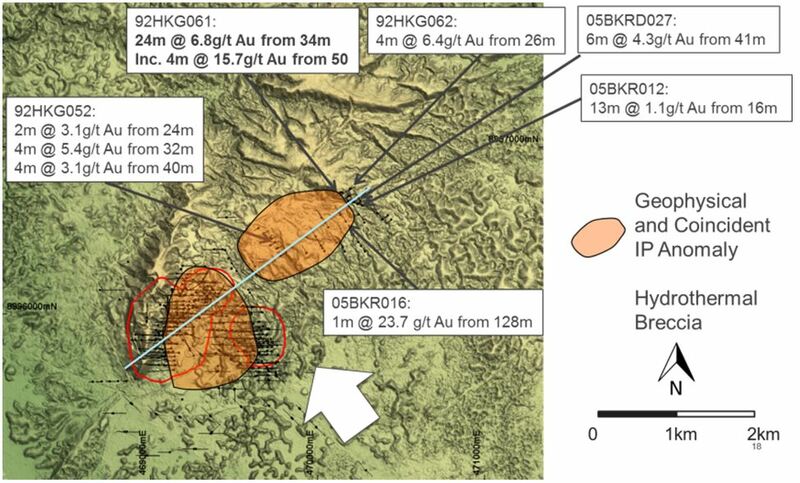 The Kulumadau North area is a priority for Resource expansion, as it contains historical surface workings, significant gold intercepts at the edges of the interpreted anomaly (drilled by previous explorers) all of which fits with the geological model developed from Kulumadau. This suggests that the area is highly prospective for Resource expansion. This hypothetical cross-section below further demonstrates the geological model for the Kulumadau area. It is proposed that the two anomalies share a common mineralising source. The shape of the system and its geophysical signature is consistent with this interpretation. 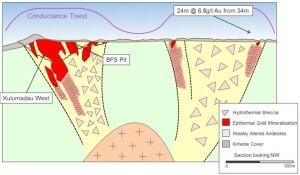 A second high potential opportunity for Resource expansion also exists within the Kulumadau deposit. The village of Kulumadau has restricted drill access to the southern part of the Kulumadau hydrothermal breccia. The opportunity for further high grade mineralisation along the southern breccia zone remains untested. The Kulumadau area has the potential for significant Resource expansion.